Remember one lunch time the bell went for break over, the snow was laying on the ground so I made a slushy snowball and lobbed it in the air at three lads in front of me, missed them and hit Wilkinson who had just come round the corner, being the gent he was he warmed my hands for me. I was at Ballygo the year it opened, the first term at assembly a boy from Highfield was paraded in front of the whole school, made to bend over a chair and given six of the best by Chuck Caldwell - his crime - bringing an air pistol to school. ma wee hubby wants 2 no does any1 remember Jimmy Jesus (Jim Thompson)..Pritchard,Reynolds? R30 George ` you flamming bumtit` Morrow, R31 Wee `Beatnick` McDonald, R32 Store ? R33 Karl`Rubber Gub` Murray, R34 Stan`the man` McIroy, R35 Victor `Tickle` Nichol, R36 Cliff Thompson. The entire assembly was in uproar,some of the teachers even struggled to maintain straight faces, `the Wilk` was left standing on the platform looking stupid and with steam coming out of his ears, a scapegoat had to be found ! The `Wilk` pointed into the 1st formers at the front and said`you boy, room 1` the boy protested his innocience, but the`Wilk` retorted `room 1 now ! `, again the boy protested and the`Wilk` put his hand through his hair and said`boy i am going to lace you, room 1 now !` With that the boy left to report to room 1 and as I later found out, received a right lacing from the `Wilk`. Everyone at assembly that day knew that the `fart` had come from the back of the hall, but this was `the Wilk`s` way of saving face. Does anyone remember `wee beatnick` McDonald ? A rare wee creature indeed. Four foot nothing, ginger hair, a wee ginger goatee and rimless specs. He could not cane to save his life but insisted on using the cane himself. He had the most peculiar action, when lifting his arm with the cane, his right leg would also lift up off the ground. As his arm came down to deliver the stroke, so to would his leg come down at the same time. It was hilarious to watch ! He gave me four strokes one day and it was like being savaged by a dead sheep. I was only mean`t to receive two strokes, but I could not stop laughing at this wee man`s leg going up and down. On the last day of term in 66/67 I think, he was standing talking to a crowd of boys when a group of leavers walked by. A fist went through the crowd and caught `wee beatnick` a haymaker, which floored him. 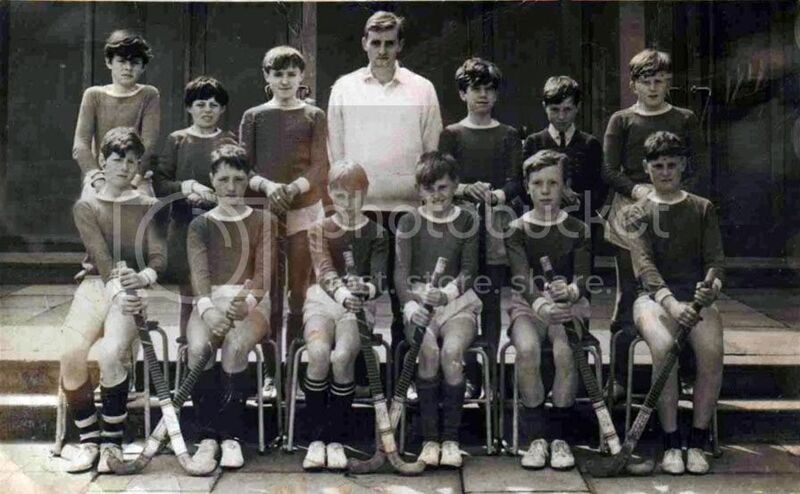 Does anyone remember Cliff Thompson at Ballygo? He was my form teacher in second and third year. He was an absolute gentleman, a committed christian and Irelands number 1 table tennis player, for some years. I think he may have died in a car crash in the mid 70s, but I am not sure. Does anyone remember Mervyn `the beast` Andrews, Class A, Grade A, sadist ? He would hit you with whatever came to hand, eg, blackboard duster, window pole and his favourite was the 2 x 1 piece of wood from the school desks that most of us would put our feet on. He would make you bend over the desk and wack you as hard as he could. We were in 1st form and he sent for a boy from 2nd form. He grabbed this boys hair and continually beat his head against the blackboard, until the boy begged him to stop. The boy s `crime` ! He wanted to leave the hockey team that Andrews looked after ! The biggest joke of all was that Andrews taught RE ! Hockey team photo: Mike`Jethro` Bowden played hockey at senior level for Lisnagarvey. He also played section one cricket for Lisburn. He may have represented Ireland at both sports although I am not sure. The lad in the back row extreme right might be Bill Baird and the lad in the front row 4th from the left might be Edward Phillips.